With the new season set to begin, it seems like everyone and their grandmother is partaking in the annual ritual of letting their predictions for player performance, team success, and the like be publicly known. Justifiably so, because it can serve as a fun exercise not only for bragging rights in the future but also as a learning tool. While the immense amount of variance and circumstance in hockey doesn’t lend itself all that well to cobbling together an infallible projection system, there’s still a seat at the table for statistical projection systems. Even if they just purely serve as a conversation starter or starting point of sorts. At the very least they can help remove confounding variables such as personal biases, even if they do admittedly have difficulty accounting for things like usage and changes in circumstances on an individual level. The fine folks over at Hockey Prospectus have provided me with the aforementioned projections which can be found in the latest installment of their well-renowned book, previewing the upcoming season in extensive detail. While there’s generally a plethora of worthwhile nuggets in there spanning the entire league, for our purposes here we’ll focus on the projections for the 2015-16 Canucks. A disclaimer: I would generally refrain from putting too much stock into the raw games played totals, because VUKOTA is quite the little hypochondriac. While we do need to account for the fact that players tend to miss time throughout the course of a season as the 82-game grind takes its toll, obviously the Canucks won’t have just one player crack the 70 games played mark for the year. So with that in mind, I’d put most of the focus on the points/82 games column on the far right. Should the Sedins stay healthy all year – which honestly shouldn’t be something that is just considered as an automatic, even though fans of the team have been spoiled by Henrik’s unparalleled durability – hovering around the 70 point mark sounds about right. It’s just off the of the pace they were running at last year, accounting for the potential of a slight downtick based on them being another year older. If anything the projection is being slightly generous with Daniel’s 23 goal pace, something he hasn’t done since the 2011-12 season. It’s still conceivable that Chris Higgins and Linden Vey both reach those 60ish games they’re listed at above though it’s worth noting that these numbers were run before their respective injury and demotion. If it will put your mind at ease, switch Vey and Baertschi around. The Brandon Sutter numbers strike me as a tad generous, but certainly attainable. Especially if he’s going to get an initial uptick from riding shotgun with the Sedins and receiving PP1 time. For those that are curious Nick Bonino is projected for 51.3 points/82 games. I actually like the pace they have Bo Horvat at quite a bit. If he can approach 20 goals and maintain a strong two-way game, that’s an awfully nice asset for the Canucks to have. As you may have noticed, there are no projections for Jared McCann and Jake Virtanen because of their lack of NHL experience, which means that we’ll have to go with their NHLe of 22 points for Virtanen and 35 for McCann. It sure would be nice for the Canucks if Edler could approach 40 points this season. That would certainly be no small feat, given that only 27 defensemen in the league managed to do that last year. While 30 points would be a noticeable jump for Yannick Weber based on the fact that his 21 points from last season were a career high, there’s a world in which he picks up where he left off from last season. There’s certainly an opening there on the 2nd pairing and power play for a guy with his offensive capabilities. Ben Hutton’s NHL equivalency puts him at 18 points. It’s a distinct possibility he can match or exceed that if he carves out a legit full-time role for himself on this team though it’s worth noting that’s nowhere near a given despite his strong preseason showing. There’s also the fact that he’s currently paired up with the offensive black hole which is Luca Sbisa. Putting it all together, VUKOTA also ran a projection for team-based success. It has the Canucks struggling to score goals as a group; their 216 goals are only ahead of Buffalo, Calgary, Florida, and New Jersey. As a result Vancouver is pegged for 90 points on the season, which has them squeezing into the playoffs as the 3rd seed in the Pacific Division (just two points ahead of a surprisingly game Oilers team, and seven points ahead of a regressing Flames squad). Finally, I figured it was worth bringing Micah McCurdy’s projections into this discussion. 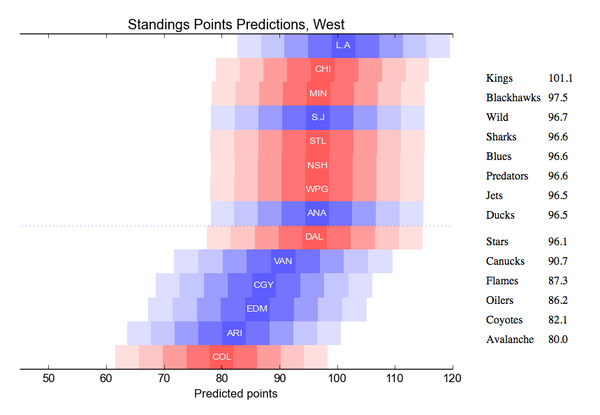 He recently released a breakdown of the Western Conference using his own predictive model. Interestingly enough he similarly has the Canucks with ~90 points this season, but according to him that won’t be enough to make the postseason. For whatever it’s worth, the current Over/Under point total for the Canucks is set at 85.5. Playing either side of that fence might not be for the faint of heart, though. The safest best might just be to let this one ride out and cross your fingers for the best. Good to have you back dmitri. Always felt like some your writing was the best on here. Too many unknowns to accurately predict how this season will pan out. I don’t think many people would have predicted that McCann and Hutton would be on the opening right roster in addition to Virtanen. It’s definitely exciting but who knows how this will pan out. Even the projection systems think the Canucks are lucky to be in a soft division. Sedins’ll be good for 65+ points. Everything else is anyone’s guess. I don’t know… This doesn’t jibe with what Benning says when he tells me the Canucks are going to be at the top of league scoring again have great special teams. I don’t think Filipovic’s watched much hockey since he’s been gone. They have lost Mathias’ 18 goals, Bonino’s 15, Vey’s 10, and Kassian’s 10 goals. They also lose whatever age-related declines hit their older players. But they have added Virtanen, McCann, Baertschi and Hutton, who are all offensively gifted guys. Sutter not so much, but he should pot at least 10. It also seems reasonable that Horvat will pot some more goals. I am not so worried about scoring goals so much as keeping them out of our own net. On the forwards chart, shouldn’t Brandon Sutter have a pts/82 of 49 instead of 39 considering that his projected goals and assists output are 21 and 28, respectivley? I’m gonna assume its a misprint of the Assists/82 being 28 instead of 18. Good article. One nit-picky thing: do you have the playoff information right? Wouldn’t WPG and NSH get the wildcard spots for Micah’s predictions? The Canucks should claim Jordan Schroeder on waivers and then trade him for a draft pick. Interesting. No Chicago or Anaheim. I’m looking forward to seeing how close they are come May 2016. I grow exhausted of the claims the Oilers will be good.The Flames will be our real opponent. I predict a fun season. No idea where the Canucks will finish. I expect a scrappy team till the end. McCann is a Kesler clone. Edgy. Nothing his personalty has done to endear him to the fans..just his play. Bo will be the captain when Hank retires. Who Jake will be is interesting. Hutton is intriguing as well. Nice to see some sanity return to this blog; a well researched article but not smug and/or condescending. You have been missed, Dim. The Corrado saga has bothered me since his ELC clicked in. It was a waste of a series vs the Kings, he stayed in the AHL then lost on waivers. He wasn’t going to be a star, but a poor and Tanez sure. Steady reliable backend Dman. Anyway, I do like the mix of vets and youth. The Sedins were both in the top 10 in scoring and believe they both will be back around 80 points, Vrbata and Burr around 25 and 20 with usual 2 way production from Higgins and Hanson. Improvements will be the 4th line and the excitement guys like Sven, Jadred, Bo Jake and Ben will bring. Health permitting, I believe they all will stick with the club and improve the overall energy of the team. The stale Canucks are no longer stale. On a side note, I wish Sven would get a chance with the Twins. His speed, passing and shot would fit well with those guys. If they keep McCann between Burrows and Hansen, he’ll stay up. Ideal wingers for a rookie 2 way forward. Hopefully when they rethink Sutter with the Sedins he’ll be moved between Prust and Dorsett for a very Benning (and quite good) line. Trying to predict how the Canucks will do this season is like trying to predict the weather. Too many new players, to many new line combinations. This season more than ever one should just kick back, drink a beer, and enjoy some hockey.